Our community railway line can learn so much from other community railway lines - see what they have done, listen to what has worked for them and what hasn't, and adopt best practise, piggy-backing on the experience of others ... while at the same time taking a fresh look and trying out new things. So we're a member of ACoRP - the Association of Community Rail Partnerships. We acheived quite a bit before we were admitted as members (and that was quite a stressful process, with high hurdles including prior acheivements to be jumped), but as members we gain links to experts and other CRPs and the Department for Transport which are extremely valuable in helping us be even more effective. As well as listeing to others in ACoRP, part of the role of a member is to inform other CRPs and let them learn from our best practise, to get in touch with other CRPs in their area for mutual or group working, etc - and to aid this, ACoRP produce an online magazine called "Train Online" ... following on from this post is our introuctory submission for the forthcoming issue. 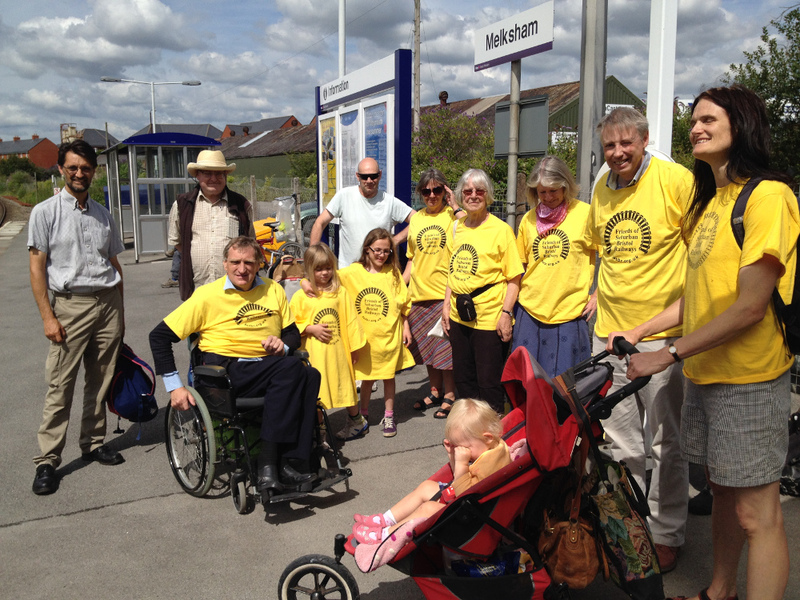 The Swindon to Westbury service, being fostered by the TransWilts Community Rail Partnership, saw an increase from 2 to 8 trains each way per day last December, funded under an LSTF grant for a trial 3 year period. The service runs from Swindon to Westbury via Chippenham, Melksham and Trowbridge, with the TransWilts trains being the only regular passenger trains on the single track section from Chippenham to Trowbridge. With trains from Swindon at 06:12 and 18:44, the previous service wasn •t attractive to many customers, and there were just under 60 journeys a day made on the section unique to this service, with few of them getting on or off the train at Melksham, in spite of it being a town of some 24,000 people. The target in the first year is to raise the journeys on that section to 135 per day, and up to 320 per day by the end of the trial. Wiltshire Council, First Great Western and the local volunteers have all been playing a major role in promoting the extra services (run by a single carriage class 153 train), and in promoting similar enhancements on Saturdays and Sundays too, and recent counts have recorded weekday passenger numbers just over 400 (regular working day) and 500 (half term). Getting people onto the trains - especially from Melksham - is all about getting people to try something they •ve not done before as in essence it •s a service change that now meets a new market. 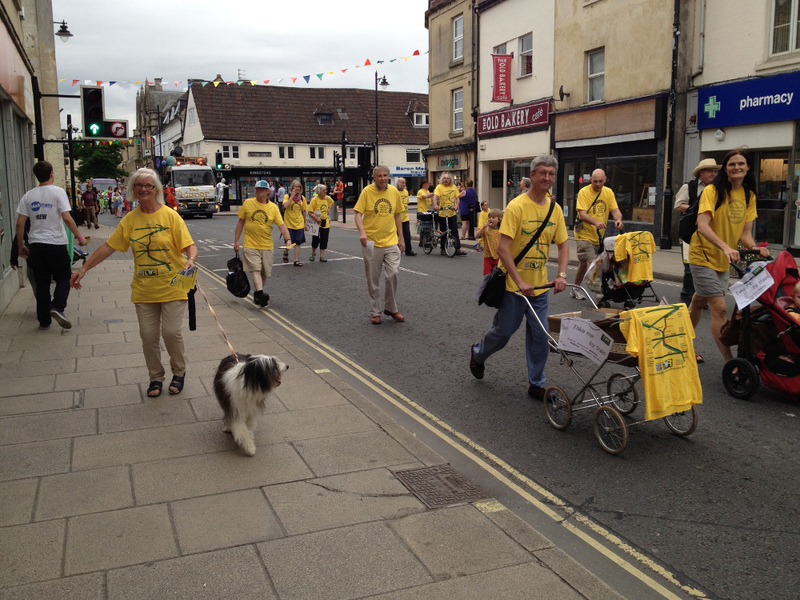 So we •ve been promoting widely - local press, on line via Facebook, door to door leafletting, and even walking in the Melksham Carnival, which we did on 12th July aided by friends from FOSBR (Friends of Suburban Bristol Railways). They all arrived on the new train service (of course!) and the theme of our group was •Üthings you can take on the train •[9d]. 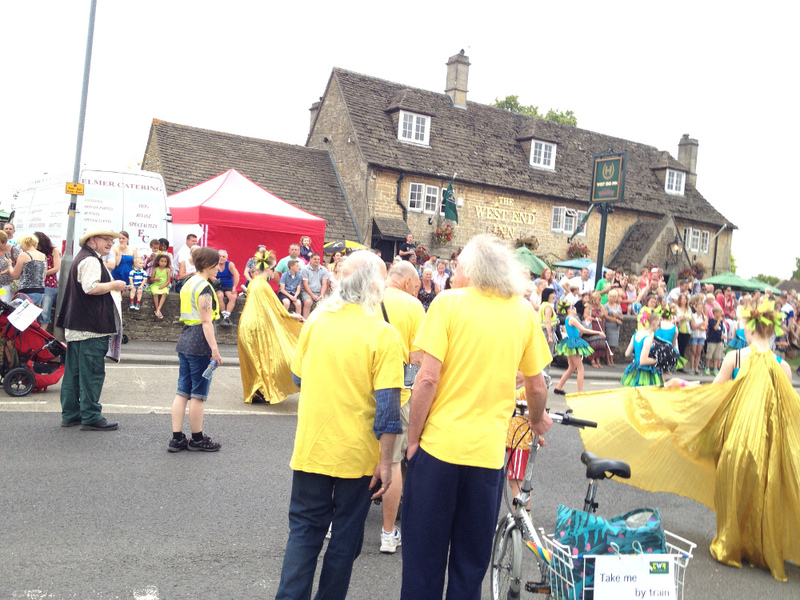 We had pushchair, wheelchair, cycles, dogs, and suitcases with us - people from child-in-buggy right through to pensioner! And we handed out specially printed timetables with a selection of day out ideas and prices too. Summer is the time that holiday-area community lines are busiest, but we •re not really a holiday line. Indications are that many of our 400 to 500 journeys are daily commutes, and with people moving home and / or job as they can do so. We •re displacing road traffic too, and although there •s free parking at Melksham station, it •s turned out that we •re pretty green - we have a free commuter rail link bus from the further suburbs to the station in the morning (and it waits for the trains in the evening if they •re delayed!) and lots of people are walking. But the story •s not just about Melksham •æ Trowbridge to Swindon is now direct (no dogleg via Bath Spa), faster and cheaper. And the direct train relieves overcrowding on the service into Bath, meaning that people are not being denied boarding so often due to overcrowding at Bradford-on-Avon. 3. Our •ÜOut of Town •[9d] contingent - arrived at Melksham Station at 15:00 on 12th July for a talk on the Wiltshire, Somerset and Weymouth Railway and to walk in the carnival parade.